From a seated position extend the legs out. Push the inner ankles together and align the toes sideways (the pinky toes and outer leg have a tendency to stretch out more due to the external rotation of the legs). Stretch the spine upwards lengthening it as much as possible then lean forward and down with and exhalation. Allow the body to curve slightly at the shoulders in the beginning. Relax there for a moment until the muscles release then try to straighten the spine forward. The elbows can open to create space around the neck for the elements to flow. Holding the wrist around the feet creates a good shoulders stretch. Always try to lengthen the torso and raise the navel forward. It may be more beneficial to curl the upper body. The back is stretched more especially around the shoulders and neck. It is however harder to take deep breaths as the lung volume decreases. When you are really flexible this will not be an issue. You may need a deeper stretch such as Yoganidrasana. after the shoot. It is important to stretch the big toes inward in many postures such as Akarna Dhanurasana and the bound version of Parivrtta Upavistha Konasana. The big toes can also be stretched in many other postures including this one. Stretch them when you first enter this pose by holding the big toes and pulling them back towards the body while extending the pinky toes and outer legs out. This will also stretch the outer muscles, ligaments and tendons in the ankles. After a while the inner legs can be lengthened and the toes can be aligned horizontally with the inside of the big toes touching perfectly. The hamstring muscles are stretched (the biceps femoris, semitendinosus and the semimembranosus). If the toes are pulled back a little the gastrocnemius and the soleus and the achilles tendon are stretched. 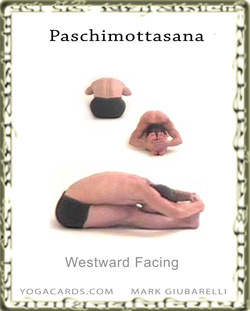 This pose is part of a Yoga for Back Pain sequence. Practice yoga at home with a printable Home yoga flow showing this pose blended with other yoga poses. Home yoga practice with Boat pose. Print out a Vinyasa yoga flow card. This is a good posture to end a sequence in. It is also a good posture to perform after a back bend sequence.